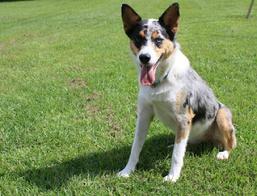 Peeps is an Australian Shepherd-Terrier mix. We adopted her out of a South Florida Australian Shepherd rescue center. She is the second of the termite detective dogs that we trained. Peeps likes to work and she likes people – a winning combination for a termite dog! Woody is our newest four-legged termite inspector. He has taken over for Rudder, who snores they day blissfully away. 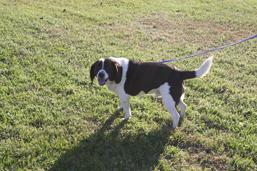 He is an energetic terrier mix of no specific lineage. He is a termite finding machine!! We purchased Cricket in 2000 from a South Florida firm that is no longer in business. Cricket had been rescued from a animal shelter and everyone who had ever met her, knew that this was a Very Special Dog. Cricket was a teriffic show-n-tell dog. We could take her to any event and guarentee that she'd act like a lady. She toured schools, real estate offices, and community centers with her handlers and was never less than loving to every person she met. We lost our princess in 2012, the last Friday of February, to a heart that had been failing for a long time. Our Cricket was such a success that HT&PC needed another termite dog! Misty came to us from a Birmingham firm in 2002 that also trains drug, bomb, and arson dogs. 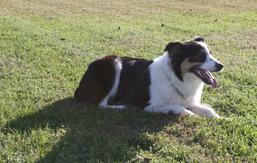 Misty was a full blooded Austrailan Shepherd. She was more high-strung than Cricket. Misty was happy to be a working dog. She also required many toys, and the more interesting the toy, the better. It might slow her down from chewing it to death before the week was over. We lost our pretty Misty to a brain tumor in March 2011. Rudder - "Fat Boy" is now Retired! Rudder is a beagle. We purchased Rudder from a company just outside of Jacksonville in 2010. Rudder's compact size and happy personality make him a terrific termite dog. Rudder is now retired. He lives full time with Mr. Ryan Madden. Dixie is the first K-9 termite detective completely trained by the Hadley team. Mr. Hadley taught her scent differentiation. HT&PC built a false wall for termite training purposes. 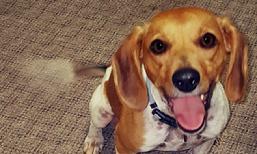 We found Dixie listed as a pet for adoption on www.PetFinder.com. She was at the Montgomery (Alabama) Animal Shelter. The biography of Dixie listed her as a busy dog who needed a job! Dixie is now retired and lives with her 1st handler, Chance, in Texas. We miss her, but we know she is happy! A human nose is made of hard cartiledge; a dog's nose is made of folded skin. Humans smell in parts per hundred and dogs can smell in parts per trillion. In fact, a dog has more than 220 million olfactory receptors in its nose! Humans have only 5 million. Since dogs can smell in parts per trillion, they are able to distinguish individual odors in a way that humans just can't duplicate. If there were a pot of soup cooking on the stove; all you, the human, would be able to smell is the overall aroma of the stew. A dog, however, can distinguish each individual ingredient in the soup, such as celery, tomatoes, carrots, beans, chicken broth, etc. This incredible ability to decipher odors is what makes a trained dog a great tool in fighting termites. A knowledgable handler and termite dog combination is the best method there is for detecting termites. A termite dog's handler must be on the alert at all times, because he is the reasoning member of the team. 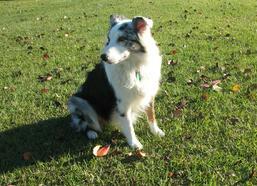 The handler must not only know his dog, but must also know how termites behave.